Milled flaxseed is a good natural food product that is high in Omega 3, Alpha linolenic acid and fiber. 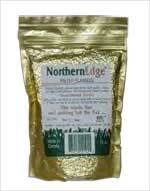 I prefer to buy Northern Edge brand because it comes in a vacuum-packed, air-tight re-sealable bag. Once the flaxseed has been flaked, it can become rancid very quickly. This particular brand is carefully milled at a cool temperature to preserve the nutrients. For example, when making oatmeal, I will add the milled flaxseed after cooking. I will never add it to the boiling oatmeal during cooking. Bananas are a great food you can eat either as a snack or with cereal or even in cooked dishes. They are very high in potassium. They always make me feel feel relaxed. Plus they are a good, high energy food. Bananas are perfect for a healthy eating plan. At Oregon State University’s Linus Pauling Institute, a study was conducted that demonstrates how Alpha-lipoic acid can be effective in reducing trigycerides. The study was conducted by Dr. Regis Moreau and colleagues (Judy A. Butler and Tory M. Hagen). High triglyceride levels will often occur in obesity and can lead to liver disease, atherosclerosis and premature mortality. Triglyceride levels can be reduced with proper diet and exercise, but these measures are not always effective for everyone. In the 5-week study, rats were bred to be obese and diabetic. When the rats were 5 weeks old, they were given 200 mg of Alpha-lipoic acid per day per kg of body weight. A control group of rats were given the same diet without the Alpha-lipoic acid. The study showed that although the triglyceride levels in the rats that were given the Alpha-lipoic acid doubled, the triglyceride levels of the control group quadrupled. This demonstrated that Alpha-lipoic acid can be effective in lowering triglycerides.